We're just a few hours away from a pair of big Nintendo events in the US and Europe, where actual, useful information pertaining to the release of the 3DS will be revealed. To pass the time, then, let's make some predictions. There are three key pieces of information we're likely to have by the time the events are over: a price, a release date and a line-up of launch software. Actually, since we're talking about two different regions, make that six key pieces of information. Our house rules are simple. Make your predictions below. And that's it! To help get you started, here are some points of reference: the DSi launched in the US at $170 and in the UK at £150. It was released in Europe two days before it was released in the US. 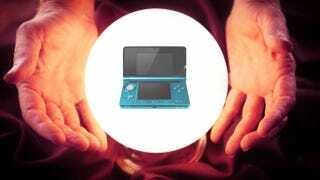 The 3DS will be, according to Nintendo, released sometime in March in both NA and Europe. And here are Japan's 3DS launch games. Oh, and Japan's launch price for the handheld, too — in short, the handheld costs what a Wii used to. For what it's worth, here's my predictions on release date and price. It'll be out on March 27 in North America and sell for $249, while in Europe it'll be out on March 25 and sell for €249.